Qing dynasty porcelain statue of Doumu, dated between 1700–1800. Dǒumǔ (Chinese: 斗母; literally: 'Mother of the Great Chariot / Big Dipper'), also known as Dǒumǔ Yuánjūn (斗母元君 "Lady Mother of the Chariot"), Dòulǎo Yuánjūn (斗姥元君 "Lady Ancestress of the Chariot") and Tàiyī Yuánjūn (太一元君 "Lady of the Great One"), is a goddess in Chinese religion and Taoism. 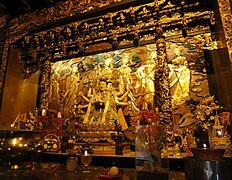 She is also named through the honorific Tiānhòu (天后 "Queen of Heaven"), shared with other Chinese goddesses, especially Mazu, who are perhaps conceived as her aspects. Other names of her are Dàomǔ (道母 "Mother of the Way") and Tiānmǔ (天母 "Mother of Heaven"). She is the feminine aspect of the cosmic God of Heaven. The seven stars of the Big Dipper, in addition to two not visible to the naked eye, are conceived as her sons, the Jiǔhuángshén (九皇神 "Nine God-Kings"), themselves regarded as the ninefold manifestation of Jiǔhuángdàdì (九皇大帝, "Great Deity of the Nine Kings") or Dòufù (斗父 "Father of the Great Chariot"), another name of the God of Heaven. She is therefore both wife and mother of the God of Heaven. In certain Taoist accounts she is identified as the ambiguous goddess of life and death Xiwangmu. In the esoteric teachings of Taoism she is identified as the same as Jiutian Xuannü (九天玄女 "Mysterious Lady of the Nine Heavens") and Xiwangmu (西王母 "Queen Mother of the West"), representing the mother of the immortal "red infant" (赤子 chìzǐ) Dao enshrined at the centre of the human body. This links her directly to the myths about the birth and initiation of Laozi and the Yellow Emperor (whose mother Fubao became pregnant of him after she was aroused after she saw a lightning from, or turning around, the Big Dipper), as attested, among others, by Ge Hong (283-343). 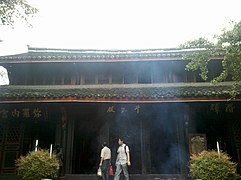 In Vajrayana traditions of Chinese Buddhism (Tangmi), Doumu was conflated with Bodhisattva Marici at least by the Tang dynasty. Marici too is described as the mother of the Way and the Dipper, at the centre of Brahma's Heaven of primal energy. Marici's chariot is dragged by seven pigs. Wikimedia Commons has media related to Doumu. ^ a b c Wells (2013), p. 10. ^ Fowler (2005), p. 213. ^ a b Pregadio (2013), p. 1207. ^ 抱朴子曰：復有太清神丹，其法出於元君。元君者，老子之師也。太清觀天經有九篇，云其上三篇不可教授，其中三篇世無足傳，常瀋之三泉之下，下三篇者，正是丹經上中下，凡三卷也。元君者，大神仙之人也，能調和陰陽，役使鬼神風雨，驂駕九龍十二白虎，天下衆仙皆隸焉，猶自言亦本學道服丹之所致也，非自然也。ctext.org. See translation in "Humans, Spirits, and Sages in Chinese Late Antiquity: Ge Hong's Master Who Embraces Simplicity (Baopuzi)", in Extrême-Orient, Extrême-Occident, 2007, N°29, pp. 95-119. Academia.edu. Wells, Marnix (2013). The Pheasant Cap Master and the End of History: Linking Religion to Philosophy in Early China. Lulu.com. ISBN 1931483264. This page was last edited on 11 May 2018, at 13:58 (UTC).